It’s early days for Inside Government but we wanted to share some analytical data on user traffic, demand and engagement. Inside Government is just three weeks old. We launched with five government organisations on 15 November and it felt good to get going. With no time to waste, another four departments will be joining the original five in a few days time. So how is the site performing? Honestly, it’s still a little too early to say. We’ve just completed a round of user interviews and we're finishing off some large-scale, quantitative usability tests, which our Insight team will report on soon. We expect to hear about what’s working well and what needs rethinking. We're also watching our analytics closely. Being so new, Inside Government hasn’t generated very much in the way of analytical data, but we wanted to share some of the early figures (from 15 November to 5 December) to give you an idea of the levels of user traffic, demand and engagement. Between 15 November and 5 December, Inside Government received 557,276 visits from 330,828 unique visitors. That’s approximately 3% of visits and visitors to GOV.UK. These figures are as the departments expected and in line with what we predicted. Following on from the Inside Government beta, we projected that Inside Government - with just the ministerial departments on board - would generate 18% of the visits to GOV.UK. It looks like we're on track. Arguably, more important than numbers, is engagement. Inside Government visitors viewed a total of 1,536,495 pages. Those users visited an average of 2.76 pages per visit, and the average duration of each visit was 2 minutes 23 seconds. The average bounce rate for Inside Government is 57%. Although Inside Government is more of a reading and browsing site than the rest of GOV.UK, there is still a strong element of the ‘quick do’. Google judges a bounce rate of between 40 and 60% as 'decent' for a content-led site like ours, so we're not doing too badly. In terms of traffic sources, it will come as no surprise that most users, ie 50%, come to Inside Government via search, 35% come via referrals and 15% are direct traffic. Ten percent of traffic is from mobile devices compared with 19% of visits to GOV.UK, which is possibly due to the desk-based professional-practitioner nature of Inside Government’s user base. 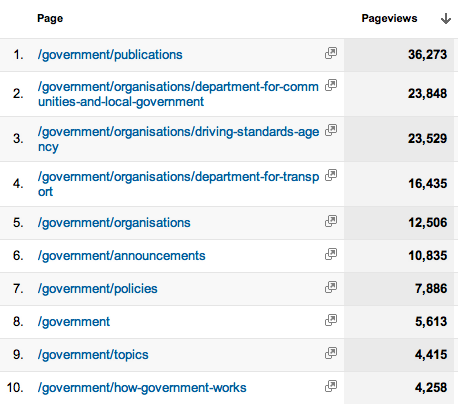 We've been curious to know what content users come to Inside Government for. The top-level pages feature in the top 10. It’s satisfying to see policies up there because everyone has worked hard to produce a new and compelling way to access and read government policies. 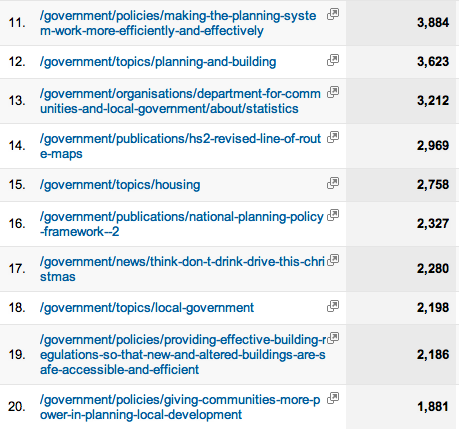 And when we look at the next ten most popular pages, there are three specific policies alongside two publications and one news item. There are also three topics in the top 20, which is another Inside Government innovation, which allows users to look thematically, as well as organisationally, across the government's corporate information. We hope people find these early, indicative figures illuminating. Shortly we will open a tab for Inside Government on the GOV.UK dashboard, which will give an overview across organisations, showing trends and highlighting things we need to work on. This will transform and enrich our data. Putting this data, and its visualisations, in the public domain is important for transparency purposes. Hopefully it will encourage departments to produce and curate good content. The data will also highlight any shortcomings in our product and it will illustrate the impact of improvements we make. That’ll keep us on our toes and that's exactly how we like it. Could you say which four departments are moving over next? Why not anonymize the IP addresses via the Google Analytics facility? Thanks for your comments. Anonymisation of IP addresses is currently in our developer backlog.